With Xmas very close, there is still be an opportunity to purchase that special present for a wildlife loving friend. Looking for something that ‘wee bit different’ this year? 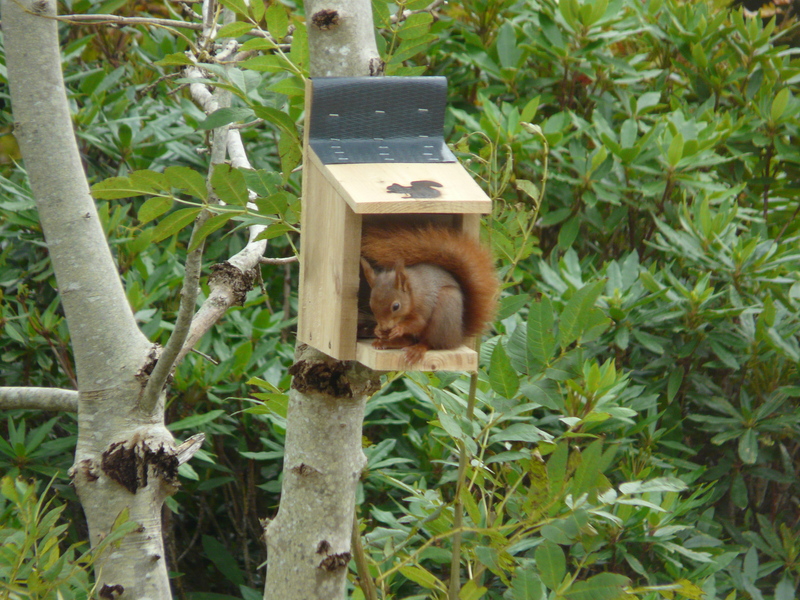 Then look no further, Cowal Red Squirrel Group have it for you. And you will be safe in the knowledge that your purchase will be helping to maintain and enhance Cowal’s Red Squirrel Population. 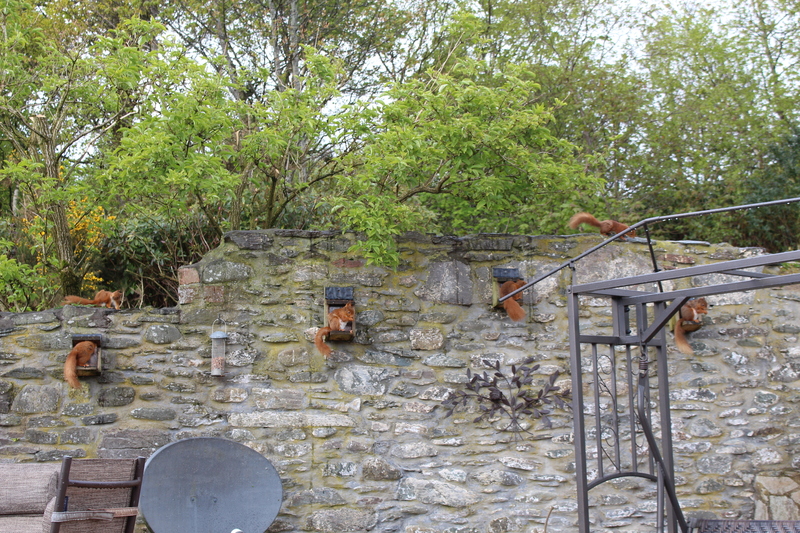 Our great value Squirrel feeder boxes are a fantastic present at only £10 each. Many hours of entertainment will be had watching the antics of the squirrels feeding with this purchase. Another great idea for a present is a membership – why not gift a membership to someone special at the great price of £10.00 you can purchase a year’s membership. 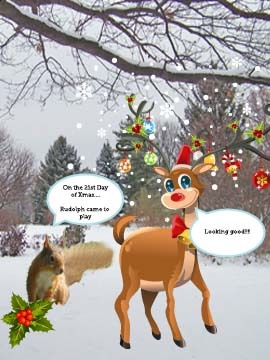 They will love it – Santa Saving Cowal’s Red Squirrels in your stocking. It will soon Be September and we are looking forward to or annual Coffee Morning in Aid of Cowal Red Squirrel Group in Innellan Village Hall from 10 till 1pm. A great day out for everyone, and a mere £2.50 entry will get you your coffee/tea and a cake! As you lick your lips you will be delighted that the pleasure your tummy is feeling was all in aid of our native Red Squirrel. In addition to the lovely refreshments you can browse an array of stalls – maybe get a wee (Should I say it) Xmas pressie for that special person. A wee squirrel feeder box maybe? Lots of lovely hours watching these lovely creatures. See you all there! 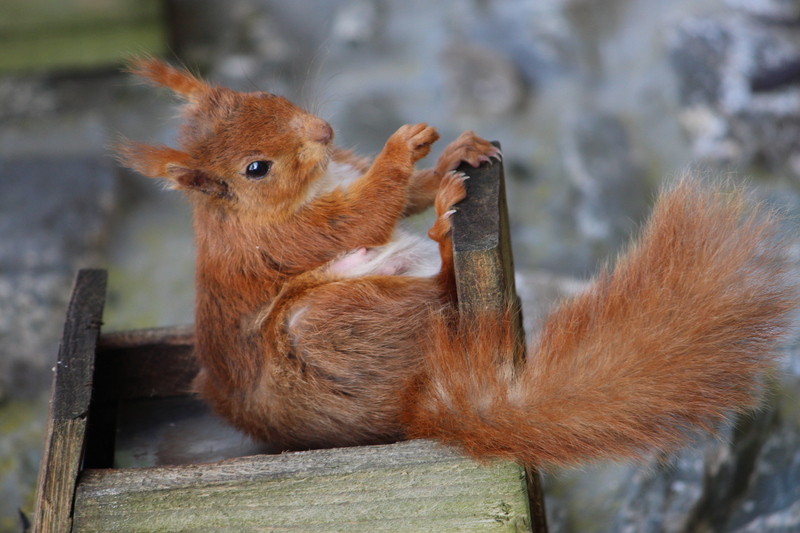 Further to our last post, Cambusbarron Red Squirrel group posted the following article, which is on the same theme as the last one highlighting interactions in Ireland between Red squirrel, Grey Squirrel and Pinemarten. Since starting my job as Project Officer for Saving Scotland’s Red Squirrels in August 2014, I have been concerned by the number of people (who have an otherwise good knowledge of wildlife) who believe that the native pine marten is a threat to red squirrels in Scotland. Some fear that the increase in pine marten numbers mean that all of their local red squirrels will be eaten by this interesting and allusive predator. I would like to respond to this Victorian notion: that all predators are damaging to the environment. It is simply incorrect to think that a predator could have such a devastating impact on an healthy population of prey-species alongside which it has evolved for millions of years. I would like people to understand that a complete and balanced native ecosystem is healthier for ALL of the animals and plant populations which live within. An ecosystem can never be complete without predators. In fact, it seems that pine martens, while not a threat to healthy red squirrel populations, may be of benefit to red squirrels in some areas. Studies show that red squirrels constitute far less than 5% of Scottish pine marten diets. 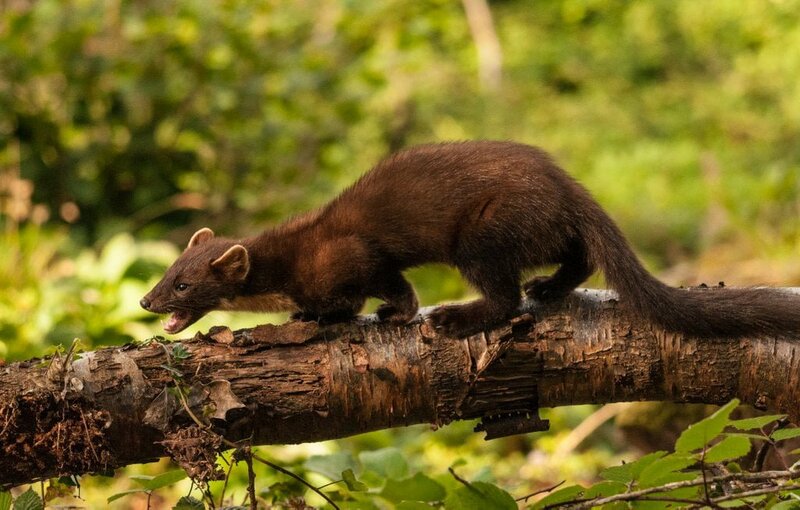 The most important food source for pine martens in Scotland is the field vole, with other small rodents and shrews, even carrion and fruit being eaten by martens far more often than they eat red squirrels. Pine martens are very intelligent generalist predators; meaning that they will focus their hunting efforts on the most abundant and easiest to capture prey. In Scotland, this means field voles. These cute little critters have very large populations and build networks of tunnels throughout any grassland (dig with your fingers into any tussock and you will likely find small tunnels containing tiny droppings and larders of cropped grass shoots) and pine martens will expend much less effort to catch voles than they would to take squirrels. The common misconception of pine martens eating so many red squirrels probably originates from heavily forested northern European countries such as Sweden. In Sweden, there are more red squirrels per acre than in Scotland and thick snow covers the ground (and the voles’ grassy tunnels) for several months out of the year. During a Swedish winter, therefore, pine martens will prey upon the more available red squirrels in order to survive. Let me repeat, Scottish pine martens do not prey on red squirrels to the extent that they effect healthy populations, such as those we protect in Argyll and the Highlands. The greatest and most urgent threat to red squirrels in Scotland is the increasing population of non-native grey squirrels and the disease, squirrelpox, which some of them carry. The grey squirrel evolved in North America, competing with many other species of squirrel; whereas the red squirrel has evolved in Eurasia without any competition from other squirrel species. The grey squirrel, initially introduced to Britain by wealthy Victorians, has lost most of its predators and many of its diseases on this side of the Atlantic Ocean. It is larger and more fearless than the red squirrel and easily outcompetes our meek little red in most habitats. In any area where the two species overlap, the reds will eventually die out and be replaced by greys. The problem is increased if grey squirrels carry squirrelpox: a virus which will kill red squirrels in under two weeks and to which greys are immune. It is this combination of increased competition and disease which causes a dangerous decline in red squirrel populations, not predation by pine martens. It might shock some people to understand that grey squirrels are much less successful at outcompeting reds when there are healthy pine marten populations. Yes. That’s right: pine martens have been shown to increase the numbers of red squirrels in an area by disturbing the heavier, slower American grey. A study in Ireland by Dr Emma Sheehy showed that in areas recently colonised by pine marten, grey squirrel numbers decreased while red squirrel populations increased. It is not even thought that this is due to pine martens eating their way through grey squirrel populations, but just the presence of this predator makes the grey more anxious and reduces its competitive edge. While it is legal to trap and hunt pine martens in Sweden (a vastly forested wilderness), I must make a point to remind all those who dislike pine martens that in this country it is illegal to kill them or to intentionally disturb them at their den. Pine martens are protected by the same laws which protect the red squirrels who benefit from their presence, and they deserve to be. 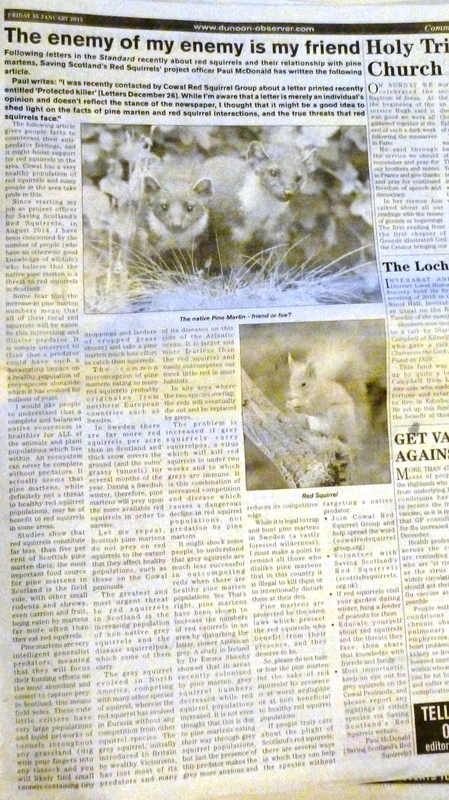 So, please do not hate or fear the pine marten for the sake of red squirrels! Its presence is at worst negligible or at best beneficial to healthy red squirrel populations. Paul McDonald (Saving Scotland’s Red Squirrels). Check out the new activities in the Kidzone !! Loads of great activities for the kids. We have had the great news that Ardkinglas Estate wish to work in partnership sponsoring Cowal Red Squirrel Group, helping to raise awareness of the loved Red Squirrel. To this end, the estate have offered to pay for an interpretation board, arrange to frame it and have it erected in the gardens. We are delighted to have this opportunity to work with local businesses to help maintain and enhance our native Red Squirrel. On the 21st Day of Xmas…. On the 20Th day of Xmas….